I have a million things I need to do (pay bills, laundry, pack for my trip to Boston this weekend, etc.)... but instead I decided to pick out my $7,000 Friday's Fancies outfit. I am going to a wedding in a couple weeks and would love to be wearing that DVF dress! At first I wasn't sure if this dress was "too white" for a wedding... but then decided it was gold and would be fine. What do you think? I added the magenta pumps for a pop of color. Have you ever worn a solid color dress to a wedding and unintentionally matched the bridesmaids? This recently happened to my friend but luckily she packed an alternate dress. As she was getting ready she looked out the window of her hotel and saw the bridal party taking pre-ceremony pictures. Her dress was almost identical! I usually wear prints but am now conscious of this potential situation... personally I would like to avoid explaining to Granda that I am not a bridesmaid. This is a gorgeous outfit, i'm in love! Haha that ecard is SO true about that age. And from then on out, too, because it still applies to 29 (even though the weddings aren't as frequent for me). Such a gorgeous ensemble for a wedding! who wouldnt want to wear that outfit! haha. Great outfit! I just discovered your blog this week and have really enjoyed reading your archived posts. 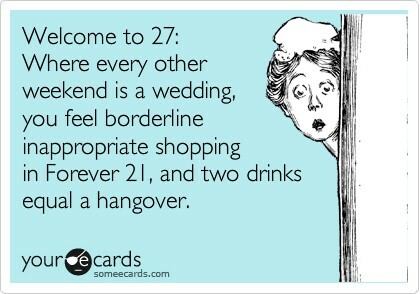 As for the e-card, I can say that the hangover situation may not improve as you get past 27, but of course it does not stop most of us from drinking. Great outfit! My sister accidentally matched the bridesmaids once and the bride was really pissed at her- mind you she was attening with a new boyfriend and didn't know the bride at all so it's not like she planned it but she will never make that mistake again!